Environmental education has failed to bring about the changes in attitude and behavior necessary to stave off the detrimental effects of climate change, biodiversity loss, and environmental degradation that our planet is experiencing at an alarmingly accelerating rate. For decades, scientists have warned of the potentially devastating consequences of climate change, and although it has become a highly politicized issue, serious problems still loom in earth's near future. A conservative approach would dictate that our societies act expediently to mitigate these potential threats. But that is not happening. Instead, we are all paralyzed by indecision, argument, misplaced politicization of the issues, and a widespread lack of commitment to change. The pace of environmental degradation, however, is not slowing. This collective inability to act is brought about in part by educational institutions that generally do not provide the tools necessary for critical thinking and for understanding the modern world. Nor do they teach individual responsibility and social engagement, two fundamental tenets of free and democratic societies. So what exactly is it that is failing? Is it environmental education or education as a whole? We believe they may, in fact, be one and the same. Although many consider environmental education to be a subheading of science education, it must be more than that. Not only must environmental education teach people about their physical environment, it must go further to teach how to live and flourish in sustainable ways. Environmental education has failed in part because of its limitations. Who can be held responsible for this inefficacy? In fairness, the blame must be borne by everyone, as we are all responsible citizens of earth, whether or not we choose to acknowledge it. Each of us bears a moral responsibility to protect the resources that support life on our planet, not only for those we share the planet with, but also for those who will come after us. If our societies fail to do this, they fail humanity. People have the collective power to effect change on local and national levels alike. But that power must be realized and acted on by individuals, and we believe that education has a role in providing the skills to do so. As parents, we must work to assure a safe and healthy future for our children. A future that includes time spent exploring wild places and learning about the creatures that inhabit them. A future that helps children learn who they are by connecting them to where they live. As teachers, we should work toward providing students with the creative and analytical skills they will need to live good lives within whatever communities they choose. We should also strive to instill a creative curiosity about the world and an interest in learning that will remain with students throughout their lives. Just as important, we need to stay focused on improving the institutions in which we teach and our personal skills and abilities as well. As students, we must hunger for more exposure to new and broader concepts. We must understand that we are authors of the future of our communities and nations, and that we possess the power to make ourselves heard and to effect change. And as policy makers, we must listen carefully for the voice of the people and encourage participatory good citizenry at every opportunity. What is needed is a modern, practical redefinition of environmental education. One that encompasses multidisciplinary teaching approaches. One that seeks to cultivate scientific and civic literacy. One that stimulates community engagement, fosters an understanding of moral systems, and reinforces the appreciation of aesthetics. We believe it is time for a full integration of environmental education in a form that inspires practical and critical reevaluation of education as a whole. We believe this reevaluation will lead to synergistic action and real impact. The obstacles to such an educational approach are many and diverse. Understanding the complexity of the environmental problems facing our world requires a working knowledge of politics, consumption, the nature and state of educational and legislative institutions, effective metrics for measuring successes and failures, and a healthy dose of background information. Together, these ideas and disciplines will create a new vision of environmental education and environmental literacy. Our societies increasingly seem to hunger for information in the form of distilled snippets and simple solutions, quickly expressed and easily digested. Perhaps, because of the barrage of information that confronts us all daily, the trend seems to be toward a synoptic world of bullet points and "elevator speeches." But the problems affecting education, and consequently society, are too diverse to be assimilated quickly. If the solutions were simple, the problems would have been solved by now, and this book would not be necessary. The arguments we will develop require some short-term faith on the part of the reader. We will, at times, go against the typical definitions and responsibilities of education. We may sometimes sound utopian as we offer diverse ideas on our duties as parents, educators, scientists, and citizens. Nevertheless, we strongly believe these things must be said and that a new approach for environmental education must emerge. We believe a comprehensive, integrated, revitalized, and revised environmental education is essential for the survival of us all. We hope that humanity will flourish in increasing harmony with its surroundings. Humans are creatures of remarkable capacity and, without question, have the ability to find a sustainable place in this world. People need only the collective will to do it. So, how can this metamorphosis come about? We think environmental education is a logical and essential step in the process. But we must qualify this statement by emphasizing that the education of which we speak must be responsive, self-critical, flexible, and focused on the common goal of immediately reducing our destructive human impact on the ecological systems that support us. We want to provide a sort of manifesto for addressing how people think about environmental education, rather than a fix-it list for troubled, politicized, and overly bureaucratic educational systems. But to do that, we'll need to look deeper into those educational systems and the political climates in which many exist. Readers need to understand why education is not providing the tools and skills that people need in order to mitigate or circumvent the grave environmental problems our societies now face. 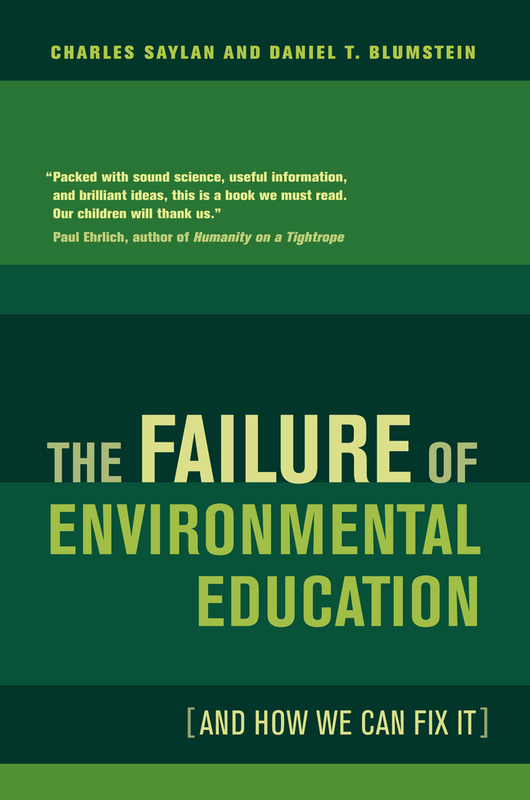 Has environmental education really failed? Imagine a graph on which the horizontal axis represents all the effort and resources expended toward making the public aware of the degradation of the environment, and the vertical axis represents the progress of the degradation itself. It would be great if efforts tended to decrease degradation, such that the line on the graph sloped down and to the right. We do not believe that is happening. This is not to say that there has not been tremendous public awareness derived from the efforts to date. Without environmental education, the planet would likely be in an even bigger, more incomprehensible mess. Even so, we believe environmental education is simply not effective enough or sufficiently available to change individual and collective behavior enough to affect the problems at hand. And we are firmly convinced that time is running out. The problems with education are systemic, and we aim to offer a new perspective and synthesis to people at all levels of the educational process: teachers, parents, students, administrators, and those who make public policy. We hope that the "people in the trenches"-the educators our societies rely on to teach responsible stewardship-will find our ideas useful in shaping their own approach to an uncertain future. They make up a talented, passionate, and committed group of people, many of whom have been the groundbreakers for helping to establish the levels of public awareness that make a book like this one possible. In writing this book we wished to put forth a positive and proactive message. There is increasing sentiment both within and outside the environmental-education community that taking a "doom and gloom" approach turns people off to any message that actions can make positive impacts on the world around us. Perhaps there is some truth to that, and we attempt herein to frame our argument in terms we hope will inspire thought and action, rather than leaving readers feeling helpless and overwhelmed. There are, however, some emerging discoveries and data about the problems we are likely to face in the near future that warrant elucidation. They are neither pleasant nor positive. Yet they set the context in which we write this book, and we believe that readers must understand what the world may look like if humanity continues its business as usual. This realization should help readers understand why we believe environmental education, as it presently stands, does not serve the purposes for which it is intended, and that this is a most urgent matter worthy of collective attention. There is little doubt our planet is getting warmer. In its most recent report, released in 2007, the Nobel Prize-winning Intergovernmental Panel on Climate Change (IPCC) wrote that "warming of the climate system is unequivocal," and, quite notably, that "most of the observed increase in global average temperatures since the mid-20th century is very likely due to the observed increase in anthropogenic greenhouse gas concentrations." Greenhouse gasses are not new, but the biophysical and geochemical cycles that regulate them have been affected by how energy has been used since the dawn of the industrial revolution. Burning fossil fuels releases carbon from the earth into the atmosphere, and the sum total of these anthropogenic sources is heating the earth's atmosphere. How much? How fast? That is what the IPCC seeks to understand. The IPCC is an organization made up of contributors from 130 countries that work under strict consensus. This means that any country has veto power over statements and conclusions made in the final report. Stop and think about that for a moment. Take, for example, a major industrial country that doesn't like an interpretation of the rate at which polar sea ice is melting because it might contribute to actions that spark national unemployment if profitable but "dirty" industries are cleaned up, or are cleaned up too quickly. Or, consider a rapidly developing country that views the prediction of sea level rise tied directly to greenhouse gas emissions as a threat to the development that is helping reduce poverty and disease and increase longevity within its borders. Either, or both, of these countries' IPCC representatives might veto a strong environmental statement in favor of a statement of milder predictions that will have less of an economic impact in its respective country. Practically speaking, that means the IPCC consensus report is a very conservative estimate of the likely consequences of rising atmospheric greenhouse gasses. And even in its "watered down" consensus form, it's a truly frightening read. In the 2006 documentary An Inconvenient Truth, former U.S. vice president Al Gore explained the mechanics of greenhouse gas emissions for a popular audience. It became the fourth-highest-grossing U.S. documentary film of all time. The film helped lift the veil of misinformation surrounding global warming issues perpetrated on the public by political naysayers and special interest lobbyists. It also brought new acceptance and discussion of the problems associated with climate change into the international limelight. Another important milestone was the publication in 2006 of The Economics of Climate Change by the eminent British economist Lord Nicholas Stern. The report a report focused on the assessment of future impacts of global warming on world economies. Essentially, the report states that the benefits of concise and early action, on the part of world governments, to reduce the effects of global warming far outweigh the costs. Lord Stern went on to say that an immediate and continued investment of 1 percent per annum of the global gross domestic product (GDP) is necessary to offset the worst effects of climate change, which include a "major disruption of economic and social activities" on a scale that could rival the effects of both world wars or the Great Depression. In 2008, Stern emended his recommendation to a 2 percent investment of GDP, based on data that showed global warming trends were increasing at levels greater than previously estimated. As a result of increasing media coverage, we all know that carbon dioxide emissions are a major cause of climate change. We also know that these emissions, despite years of negotiations and discussion by the world's nations about how to reduce their release, are still increasing, not decreasing. Although there is still a good amount of debate and discussion as to how much is too much and whether and where the tipping points-that is, the atmospheric CO2 levels beyond which there will be massive and irreversible changes in the global temperature-might be, considerable effort is being expended to find new sources of sustainable energy, ways to reduce automobile and industrial emissions, and scenarios by which carbon emissions can be capped and traded commercially. These are positive steps, but because they are based on a consensus view that is intrinsically biased toward underestimating the severity of the problem, they are just not enough. Indeed, if one believes the political rhetoric and mainstream media, it might seem we have turned the corner on global warming and are taking the necessary steps to mitigate its effects. This is especially true if one holds an unshakeable faith in human ingenuity or subscribes to the "humanity can fix anything with technology" school. Despite increased public awareness, most people still believe the effects of climate change will appear sometime in the vague future, when in actuality the effects are visible today. It seems when things deteriorate gradually, people tend not to notice them. The image of shifting baselines is a compelling one: a little change here, a little change there, and it all starts to seem normal. Thus, people do not see the potential for catastrophe unless something dramatic and immediate occurs. In the time frame of global warming issues, it would probably be too late to do much about the effects or causes of such an event. The major public focus has been on industrial carbon emissions and sources of efficient energy, but some other serious issues associated with climate change require attention as well. Scientists are learning more every day, and some of what we have been reading in the primary scientific literature indicates potential negative impacts of a magnitude far greater than previously thought. There has been widespread discussion of melting polar ice and what effects it might have on our world. The effects discussed range from the loss of polar bear habitats to potential economic benefits of new, less costly shipping routes, but there is more. In May 2008, researchers from the University of California at Riverside and Flinders University in Australia published findings revealing a relatively sudden release of methane, a greenhouse gas some twenty-three times more potent than CO2. This release occurred 635 million years ago, causing an abrupt shift in planetary climate from the stable "snowball" ice age to a much warmer, stable state, with little time in between. The study shows how methane was initially released gradually through destabilization of ice sheets, which, as they melted, released pressure on clathrates-a form of methane ice held stable by temperature and pressure-triggering substantially increased levels of the gas. Clathrates remain present today in their dormant state, both in arctic permafrost and in sediments on the ocean floor. The concern here is that small increases in global temperatures, such as those we are currently experiencing as a consequence of our widespread addiction to oil and coal, may trigger a similar release of methane gas. One scenario by which this could happen would result from the polar regions absorbing more heat if the reflective snow melts sooner each year both over the arctic tundra and the Arctic and Antarctic oceans. Snow and ice, because they are white, reflect light and therefore heat. This reflectance is lost when the snow and ice melt and resulting darker earth and water surfaces absorb the sun's energy as heat. Thus, permafrost, which contains frozen methane, would melt and clathrates would release their methane. The ramifications of these events, which could happen very quickly, would be catastrophic and are thought to be irreversible. The resulting substantial increase in methane outgassing could overshadow all benefits gained from current attempts to reduce anthropogenic carbon emissions. If current estimates are correct for methane release from permafrost, some 100 billion tons could be released into our atmosphere this century. That's a huge number. If one assumes an adult elephant weighs five thousand kilograms, then that's like putting twenty billion elephants into the atmosphere, or 556 million blue whales, or 3.8 million Titanics. One hundred billion tons of methane is 333 times the total mass of humans on earth. Should this catastrophe occur, earth could experience climate warming that is equivalent to 270 years of emissions at today's levels. Another, more controversial effect of melting polar ice is the resulting change in ocean salinity that could lead to a slowing or stoppage of the thermohaline circulation. This is an oceanographic mechanism whereby warm water from the tropics is carried northward via surface wind-driven currents like the Gulf Stream. As the water moves toward the polar region, it cools and its density increases. This denser water consequently sinks into deep ocean basins, where it moves southward within these basins to resurface again as it is heated. Such upwelling is a source of considerable nutrient cycling in the oceans, and this "ocean conveyor belt" is, in part, responsible for the stability of earth's weather patterns. As freshwater from melting ice enters the oceans in vast quantity, the salinity, and consequently the density, of seawater will change, potentially causing the thermohaline circulation to slow or stop. Speculation on the specific effects of such an occurrence include outcomes ranging from moderate changes in the productivity and climate of Europe, to radical alterations in global weather patterns. Such changes could, among other things, significantly reduce rainfall levels from the Asian monsoon, on which a third of the world's population depends for irrigation of agricultural crops. Seawater becomes acidified when CO2 from fossil-fuel combustion and other sources is absorbed from the atmosphere by ocean waters. This creates carbonic acid, which increases the acidity of the oceans from their natural, basic state. If the pH level is too low, calcium carbonate cannot be formed. Since the onset of industrialization, ocean acidification has increased 30 percent, which completely overwhelms any natural mechanisms that might counteract this phenomenon. This process is further exacerbated by deforestation, which is increasing globally as well. Recent research has shown that the time frame for ocean acidification is accelerating, and detrimental effects may emerge in decades, rather than centuries as previously thought. A more acidic ocean could, among other things, drive phytoplankton extinct. Under this scenario, not only would the ocean cease to remove carbon from the atmosphere, but there would be no food for fish to eat, and no fish for us to eat. This could threaten global food security and create severe economic impacts, especially in areas that depend on the sea for sustenance. Coral reefs, already threatened, may essentially vanish from most areas by midcentury, leaving coastal communities open to erosion and flooding, causing a further loss of fish habitat and creating economic damages in the billions. Perhaps the start of this will be a more acidic ocean, in which the ecosystems and ecosystem services that we depend on fail to thrive, producers of slime and toxic algal blooms are quite at home, and hypoxia and dead zones abound. Should this come to pass, it will likely happen in the next hundred or so years, but it will take thousands of years to recover to a state that even resembles what we know today. Other resource management issues, such as overfishing, have little to do with global warming directly but, in the coming decades, will likely have major negative effects on our well-being. Where ocean acidification tends to attack the ecosystem from the bottom up, overfishing tends to work from the top down. Historically, ocean fisheries have been regarded as infinite resources, able to provide a growing population with everlasting food, fertilizers, and medicines, among other things. To understand why this is so, one need only stand on the beach and look seaward. As one confronts the vastness of the ocean's horizon, the idea that our populations are capable of taking everything useful out of the sea seems ridiculous, arrogant, and impossible. But the reality is otherwise, and humanity is well on its way toward taking far more than the oceans can ever replace. Recent studies indicate that we humans have fished our way to the point where one-third of available stocks are depleted, and we're all proceeding down the food chain with alarming speed. Scientists speculate that unless fisheries management policies are not changed radically and soon, this is the last century in which people will enjoy wild seafood. Aside from the 50 billion or so dollars per year that will be lost by the world's fishing fleets, the effects of overfishing include substantial loss of biodiversity, incursion of invasive species, worsening water quality (decreasing the oceans' ability to absorb CO2), and depletion of fisheries to a degree from which they will likely not recover. Most unnerving in the short-term, however, is the fact that hundreds of millions of people depend on fish for their daily sustenance, and as the human population continues to grow exponentially, this demand can only increase. Population growth is very likely the root of many of our problems. How can our species, dependent as it is on our environment, continue to grow and flourish if the resources we all depend on do not keep pace with population growth? In 1798, Thomas Malthus thought it could not. He postulated, referring primarily to food supply, that "the power of population is indefinitely greater than the power in the Earth to produce subsistence for man." The resulting crash is known as a Malthusian catastrophe. After World War II, the green revolution changed the face of agriculture. Crop yields were substantially increased by bringing high-yield grains together with enhanced agricultural infrastructures and first-world pesticides and herbicides. As a result, countries like India and the Philippines, which were previously at the brink of severe famine, were able to become self-sufficient, feed their people, and generate revenue from grain exports as well. In this way, the impending Malthusian catastrophe was averted. Or was it simply delayed? The green revolution was indeed a miracle of technology, but in those postwar times, little thought was given to long-term impacts on the environment or society. Industrialized agriculture is hardly what we would call sustainable. It is heavily dependent on fossil fuels for fertilizers, harvesting, and transportation; uses vast amounts of freshwater; and creates dangerous outflows of pollutants and unwanted nutrients into the environment. Peak oil is the term used to describe the maximum point of world petroleum production or extraction. After this peak is reached, the supply can only decline, because the amount of oil and gas in the earth's crust is finite. Many scientists believe peak oil will occur in the 2010s, and others insist it has already passed, but no one argues that it won't come soon, except a few executives and economists from the oil business. It is common knowledge that global oil reserves are generally overstated, so it is likely that where exactly the peak is, will be known only in retrospect. One might argue that, as easily recovered oil reserves disappear, oil that is harder to extract will become cost-effective. That may, in fact, be the case if the evaluation is based solely on economic factors. But what of the environmental costs? As onshore and nearshore oil availability decreases, the search for oil is pushed farther out to sea into deeper water. And even though oil industry executives and political leaders alike tell us the technology behind deepwater drilling is safe and secure, a single mistake or error in judgment can have devastating environmental consequences. Consider the most infamous consequence of peak oil to date: the April 2010 explosion and sinking of the British Petroleum drilling rig Deepwater Horizon. This accident killed eleven crew members and left a gushing oil well open for eighty-seven days to spew almost five million barrels of oil into the Gulf of Mexico. In an effort to disperse the oil, British Petroleum sprayed more than seven hundred thousand gallons of chemical dispersants into the spill, before the Environmental Protection Agency insisted that less toxic alternatives to the selected dispersant be found. This was the largest spill in the history of oil drilling and the worst environmental catastrophe to date in U.S. history. It will take decades before the world knows the full extent of the environmental consequences resulting from the Deepwater Horizon spill, but the preliminary estimates are no less than ominous. Oil extracted from oil shale and tar sands is economically viable only if oil prices are high. That is because this oil is expensive to extract. It must be cooked out of the sands, and the industrial extraction process itself requires tremendous amounts of natural gas (used to melt the oil out of the sand) and water, and tends to degrade large areas of formerly undeveloped boreal forest and tundra. The lunacy of this is well-expressed by Rob Hopkins in The Transition Handbook: From Oil Dependency to Local Resilience, who likens extraction of oil from tar sands to squeezing thirty years of spilt beer from the sawdust of a pub floor. Something only a desperate alcoholic would do. The ramifications of oil depletion (what happens after the peak is passed) are far-reaching and potentially devastating to the way of life to which most of us have become accustomed. The cost of energy will increase, because most of our energy is produced by burning fossil fuels. And perhaps even more insidious is the likelihood that, as supplies go down, prices of all things petroleum-related will go up sharply. Oil is an ingredient for plastics, cosmetics, medications, and fertilizers. Indeed, it's difficult to imagine a world without oil. There will be widespread humanitarian costs: as oil prices rise, the price of food increases, and these increases are deeply felt in third-world countries. Availability of food may decrease globally, leading to widespread famine, the potential destabilization of governments, and the increasing possibility of wars over access to natural resources. To mitigate these effects, we will need twenty years' lead time before the point of peak oil is reached, to find alternative and renewable solutions to our petroleum dependence. If the peak has already passed or will occur in this decade, that opportunity has been passed and our civilization will probably change substantially before our societies are able to refuel. There is now much discussion in the United States about government and private investment in renewable energy infrastructure and technology. A positive sign to be sure, but this is only the beginning of that process, and it has probably started too late to stave off some of the predicted impacts on the current way of life. Some think nuclear energy will be our salvation. This is predicated on several assumptions. First, that the safety issues that led to Three Mile Island and Chernobyl can be managed effectively. Second, that nuclear proliferation and the security risks associated with weapons-grade nuclear materials can be mitigated. Imagine a world where terrorists had easy access to radioactive waste that could be used in low-tech, yet quite destructive, "dirty bombs." Third, it is predicated on the assumption that uranium, on which the entire industry depends, is available. Like oil and natural gas, uranium is not limitless. A final issue of grave concern is that of global security. In his 2009 testimony before the U.S. Senate Foreign Relations Committee, retired Vice Admiral Dennis McGinn warned of risks and vulnerabilities from a changing global climate. World shortages of water and food will likely increase, eroding political stability in countries where governments are not able to keep pace with the essential needs of their people. Access to fossil fuels necessary to maintain effective military forces will require an increasing and unsustainable transfer of wealth to oil-producing nations, many of which are hostile to the United States and its allies. Border conflicts will spread, further taxing international military capacities. Changing climate will also stress the efficiency of weapons platforms and military support structures. McGinn spoke on behalf of the Center for Naval Analyses' Military Advisory Board, whose members are all distinguished and high-ranking officers from the U.S. military establishment. While his testimony was decidedly from an American national security perspective, the risks and impacts he described will doubtless affect all nations and peoples. McGinn's testimony and the Center for Naval Analyses' reports illustrate how climate change and declining energy reserves are dangerous trends, and not solely for environmental reasons. Finally, let's consider what the combined effects of the diverse challenges we've outlined might be to the environment. In a recent publication, Jeremy Jackson looked at the synergistic effects of stressors-including overfishing, acidification, warming, pollution, and invasive species-on the health of our oceans. The study looked at four major ecosystems, of which coral reefs and coastal seas and estuaries were found to be critically endangered, continental shelves endangered, and open oceans threatened. Humanity's destructive lifestyle has led to a 50-90 percent reduction in many fish populations from estimated historical levels, the death of 50-75 percent of coral reefs worldwide, hypoxic "dead zones" near many river outlets, introduction of destructive invasive species, the filling of part of the North Pacific Ocean with floating plastic trash, frequent toxic algal blooms, and increasing human and wildlife diseases. Keep in mind this list does not even address terrestrial ecosystems, where a whole new set of issues becomes relevant. This is sobering stuff. The evidence of trouble on many levels is overwhelming, and much of it points to environmental and economic stressors that are happening now. This, then, is not a problem for our children's children, but a problem we all must address immediately. These are not national issues but pressing global ones in need of expedient solutions. We do not think there is some magical environmental education solution that will cure these anthropogenic ills. Nor do we know of any quick or all-encompassing fixes that might facilitate the integration of the ideas and concepts we outline in this book. The solutions are as diverse and complicated as the problems we hope they will remedy. Climate change effects everyone at the same time, but how societies react to its effects differs greatly by culture, economic status, location, and other variables yet unforeseen. Because we do not expect change to come initially from political institutions, we think it will have to grow from the grassroots efforts of teachers, administrators, students, and parents. And it will require flexibility and open-minded evaluation on a local scale in order to identify and refine the ideas and practices that take hold and produce results in a given community. Mitigation of impending environmental impacts will require an unprecedented effort on the part of all of earth's citizens. It will require the public to possess the intellectual tools necessary to understand and evaluate issues, and to compare sources and dig deeper into problems so as to differentiate truth from propaganda. It will require pushing the envelope of our human ingenuity and working together to create new technologies that can benefit us all. It will require that the people insist that political and business leaders move decisively to reduce greenhouse gasses and protect and conserve existing resources. In short, it will require an informed and stimulated populace. We believe the primary responsibility for making this happen falls on education, because only a decided change in human behavior will bring positive results in the short-term. Economist Herman Daly has said, "If you jump out of an airplane you need a crude parachute more than an accurate altimeter. And if you also take an altimeter with you, don't become so bemused in tracking your descent that you forget to pull the ripcord." The point of Daly's statement is that, if we wait for the empirical evidence to come in, it will probably be too late to make choices. At a time when wild places everywhere are vanishing before our eyes, Charles Saylan and Daniel T. Blumstein offer this passionate indictment of environmental education—along with a new vision for the future. Writing for general readers and educators alike, Saylan and Blumstein boldly argue that education today has failed to reach its potential in fighting climate change, biodiversity loss, and environmental degradation. 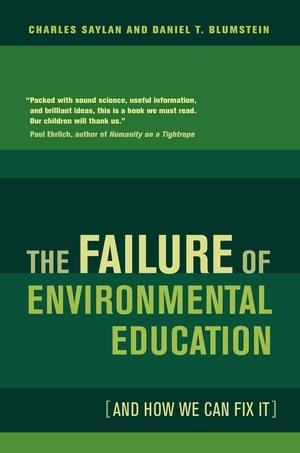 In this forward-looking book, they assess the current political climate, including the No Child Left Behind Act, a disaster for environmental education, and discuss how education can stimulate action—including decreasing consumption and demand, developing sustainable food and energy sources, and addressing poverty. Their multidisciplinary perspective encompasses such approaches as school gardens, using school buildings as teaching tools, and the greening of schoolyards. Arguing for a paradigm shift in the way we view education as a whole, The Failure of Environmental Education demonstrates how our education system can create new levels of awareness and work toward a sustainable future. Charles Saylan is Executive Director of the Ocean Conservation Society. Daniel T. Blumstein is Professor and Chair in the Department of Ecology and Evolutionary Biology and Professor at the Institute of the Environment and Sustainability at the University of California, Los Angeles. His previous books include A Primer of Conservation Behavior. "A strong argument for change. . . . Provokes the reader to envision a different reality for our schools that might lead to a better reality for the environment and future generations who depend on its health."